ViewSonic has announced the latest addition to its projector family – the ViewSonic Pro8300. 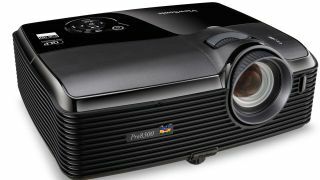 Made with business heads in mind but with enough home entertainment features for the machine to moonlight as a home cinema on weekends, the Pro8300 has been given a brightness of 3000 lumens, offers up a 4000:1 contrast ratio and has a 1.5X optical zoom lens. The technology used by ViewSonic to give the projector's images a little bit of a kick is called BrilliantColor and this is all pushed through the ViewSonic's Pixelwork PW980 10-bit image processor. When it comes to connectivity, there are dual HDMI inputs so you can connect it to a laptop, Blu-ray player or if you are feeling a little bit fancy, a tablet and smartphone. The projector is surprisingly 'short throw' as well, able to project 100-inch 16:9 images from a distance as low as 3.16 metres. And for those who don't mind listening to their audio through a projector's speakers and not a surround sound setup, there are two 10 watt speakers on board – which are decent enough for your average meeting room. The ViewSonic Pro8300 is shipping now and is priced at £999.